Welcome to the March edition of the Simply Living Blog Carnival - Clearing the Clutter cohosted by Mandy at Living Peacefully with Children, Laura at Authentic Parenting, Jennifer at True Confessions of a Real Mommy, and Joella at Fine and Fair. This month our participants wrote about de-cluttering and cleaning up. Please check out the links to their thoughts at the end of this post. I am a confirmed and reforming clutterbug. I was a packrat as a kid, and I still have problems letting go. But: I live in a small space that demands a certain level of minimalism. Plus, I'm raising kids so need to set a good example. We have honest-to-goodness hoarders in our family, and I want to avoid that fate for our set. Stuff does not equal memories. You can keep the important memories in your head and through the best photos and a very few mementos. You don't need to remember everything, like what movie you saw that one Wednesday seven years ago, so throw away the ticket stubs for that one. Your best memory-keepers are the people around you, so tell stories, take photos, write down priceless moments, and let the memorabilia go. You are not emotionally responsible for what people give you. If someone gives you a gift, it's now yours, and you get to choose what happens with it. Often relatives will give me things they don't know what to do with. I've realized my role is to be the gracious accepter, who mediates the path of this object from them to me to the thrift store, since a direct route to the thrift store was impossible for the other person. They obviously have some guilt about giving up the item; I do not have to assume that guilt for myself. Obviously, special cases would be heirlooms or loan items — in that case, I state clearly that I don't have room for or interest in certain items, and I offer to return them to the giver, with appropriate thanks for the offer or loan. We've occasionally had to be quite firm and open about what the choices are for the giver: Either take it back, or we will give it away. Get rid of anything that doesn't make you smile. This is a FlyLady prescriptive, and hard at first for me to swallow. With my archivist mindset, how could I let go of all the memorabilia reminding me of the bad times as well as the good? But soon I sorted out what it meant for me: If I felt guilty, irritated, bored, or bitter, then why was I holding onto it? I've kept some things that feel bittersweet, but with the emphasis on sweet, like memories of lost loved ones. Out went letters from an ex-boyfriend, papers that had garnered me a bad grade, and (see above) relatives' offerings that just felt like anchors rather than gifts. I somehow felt that I was supposed to hold on to things as a matter of principle: Now I make being happy the principle! Instead of thinking frugally only for yourself, think frugally for other families, too. It can be so hard to get rid of something that didn't get "enough use." And yet it can be ridiculous when we frugalistas try to quantify what enough would look like — if I didn't wear the shirt every week for at least five years, is it wasteful to get rid of it? It doesn't actually save me any money to hold onto things I don't use anyway — and if I give it away, I'm gifting it onto someone else who wants it and who wants to save some money. You're not making your items unhappy. I feel a little weird putting this one out there, but I used to have (and still struggle with) crippling guilt over letting down inanimate objects. Especially ones with eyes! Like stuffed animals — oh, geez — how could I let any go? But, seriously, any objects. Like, if I had a mug set and decided to throw out one that was chipped, I'd feel bad for the one being thrown away and for the ones being kept who now had to live without their brother. (I suspect I might be a wee bit crazy, but that's all good.) If you're like me, what helped more than someone walking up to slap me across the face and shout "Snap out of it!" (though that might have worked, too) was to turn the negative into a positive: I'm being kind to these items! I'm going to make them so happy by giving them a new home where they will be loved and used! If they go in the trash … well, um … tell yourself they'll meet a lot of new friends there. Let go of your gifts. I've known people who couldn't bear to part with items unless they knew they were going into the "right" hands. (See mention of my relatives above….) As a gift giver (and that's what you are when you donate your items to charity), you are spared the burden of handling the items from there on out. Accept that you will not determine their fate anymore, and enjoy the freedom that comes with less responsibility. You did your part in giving it; now it's up to the new owner to choose what comes next. Be judicious: You want someone who's good at decluttering, someone who's a minimalist at heart. Find someone who has just a few tasteful knickknacks, someone who will draw in a horrified intake of air at the site of your junk, someone who has no vested interest in what you keep or throw away, someone who does not let sentimentality stand in the way of a good house cleansing. For me, I lucked out: It's my husband. Sam loves getting rid of stuff. He's my coach and my sounding board. His default position, if I have a question about whether to keep something or get rid of it, is to tell me to chuck it. I need that sort of attitude around. It can help to view your "treasures" through someone else's impartial lens; you'll start to feel sheepish that you were actually considering saving your notebook from your sophomore biology class. You don't live in the Great Depression. And thank goodness for that! If you're super-duper poor, I excuse you. Keep what you must. If you're just regular poor on up, please consider how easy it is to get most anything again if you accidentally part with something you need back. There are thrift shops, consignment stores, craigslist, Freecycle, libraries … as well as the possibility of upgrading to something better than what you had before. Get rid of duplicates and maybes. Tell yourself that the money you're saving on storage and the time you're saving on dealing with your stuff all the time will more than compensate you for the occasional expense of replacing something you mistakenly purged. If you haven't used it recently, let it go. Don't live in a future (or past) dream state. If you bought untouched supplies for a hobby three years ago, it's not the pastime for you. If you no longer have an interest in half your DVD collection, sweep out the chaff. If you have eight dresses hanging with dust on the shoulders because you keep thinking you should wear dresses, accept that you're not a dress person but that some grateful recipient might be. Consider how good it feels to live lighter. All the stuff you have is a drain on your resources. It occupies your home, your mind, and your to-do list. It has to be sorted, cleaned, moved to new places, and dealt with continually. Even digital clutter has to be stored and organized. Make life easier on yourself by lifting away the burdens of things that are no longer bringing you pleasure. You'll enjoy the resulting energy boost, and that's a much better feeling than the stuff could ever give. Take advantage when you're feeling ruthless. If you're having a vulnerable day and can't bear the thought of parting with anything or find yourself putting everything aside to deal with "later," take a break to regroup. Come back when rage at the chaos is bubbling up inside you and your dream of a tidy home is filling you with desire to purge. And then get to it! As soon as you decide to part with something, out it goes. Take it to the thrift shop or a drop box, or list it on craigslist or Freecycle. If that's not possible, box or bag it up in something opaque and sealed. If you'll need to make donation records for tax purposes, do it right away so you don't get wistful going back through it later on. Saying "no" to one thing means saying "yes" to something else. Saying "no" to too many decorations means highlighting the ones you've chosen to keep. Saying "no" to clothes that don't fit or flatter means honoring your body with the ones you wear. Saying "no" to more than you can easily put away means spending less time cleaning and more time doing what you love. Saying "no" to the energy drain of clutter means saying a joyful "yes" to breathing in deep of the peaceful, calm oasis you've made of your home. Thank you for visiting the Simply Living Blog Carnival cohosted by Mandy at Living Peacefully with Children, Laura at Authentic Parenting, Jennifer at True Confessions of a Real Mommy, and Joella at Fine and Fair. Read about how others are incorporating simple living into their lives by clearing out the clutter. We hope you will join us next month, as the Simply Living Blog Carnival focuses on Going Green! 7 Tips for Cutting the Toy Clutter - In a post at Natural Parents Network, Mandy offers easy and child-respectful ideas for downsizing your kids' growing mountains of toys. De-Cluttering and Moving to Minimalism - Laura from Authentic Parenting is actively trying to achieve a more balanced life by giving up the things in order to make room for more enjoyment. A Minimalist Clutter Bug - Destany at They Are All of Me writes about the daunting task of clearing away years of clutter brought on by disorganization and a dislike for throwing things away. The Pack Rat Stops Here - Mercedes at Project Procrastinot doesn't want her twins to inherit the pack rat legacy but is uncertain how to lead by example. Clutter Minimized - Jorje of Momma Jorje shares how minimizing different aspects of her life and household have changed her life. Uncluttering Childhood - Are fewer toys and books harmful for your child? Does simplifying the stuff in your life, merely mean faster clean up? Find out if "less" is truly "more" for parents and kids alike at Heart-Led Parenting. Lagom - Sustainablemum shares her family's search for balance in decluttering their home and their lives. Letting Go - Of Things and Thoughts - Amy W. at Me, Mothering, and Making it All Work rejoices in her ability to allow others to teach her to let go - of things and of thoughts. From Cluttered to Clutter Free - Mandy at Living Peacefully with Children discusses the changes she went through from growing up in a cluttered household to becoming a decluttering diva. Facing the emotional roadblocks of clearing clutter - We all have reasons we hold on tightly to our stuff. 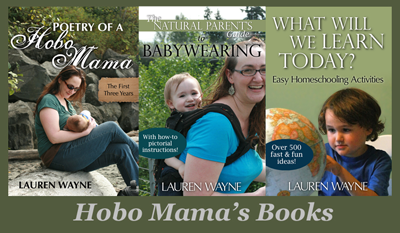 Lauren at Hobo Mama offers advice for breaking through those walls. Spring Cleaning with Freecycle - Amy at Anktangle shares how her spring cleaning ritual has become much more fun (and productive!) since she's embraced her local Freecycle community and all it stands for. OMG, dying here at feeling bad for inanimate objects. I would so. totally. do. that. Seriously, is there a name for that? There should be. I *love* your tips. 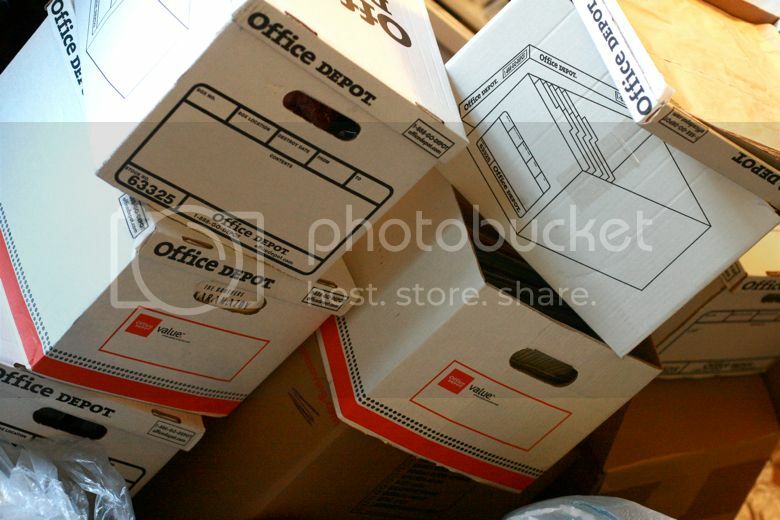 This is a great post on letting go of *stuff* and not letting the items rule you. Oh man, this gets me, "If you bought untouched supplies for a hobby three years ago, it's not the pastime for you." So.... that scrapbooking stuff I bought like 8 years ago and have moved FOUR times... that probably needs to go huh? Good call. My husband will be thrilled! @Momma in Progress: I was reading a Reader's Digest "ask the expert" column once that basically told me I was certifiable for thinking inanimate objects had feelings. ;) But I knew I wasn't alone, ha ha! Your parents sound exactly like my in-laws. They have a 3-car garage filled with … not cars! And a full basement as well, stuffed. I'll give you an out on the novel writing books: You can find all that info online now, or borrow the same books from the library (perhaps even digitally). You're not giving up, just becoming more efficient at storage! :) I say this as someone who's given up a lot of similar books! Brilliant, Lauren! I especially like your note about not being emotionally responsible for people who give you things. Something given is a "gift" by definition and this doesn't obligate the receiver to keep it. I think this is one of the challenges of parenting -- gifts given to your children -- so it's one reason why we've chosen to give such clear suggestions and guidance to our daughter's grandparents. I'd enjoying keeping what they give, so I do my best to ensure they don't choose things I'll automatically return or pass on. It is very easy for us to get attached to stuff for all the wrong reasons when we examine that relationship we find we can do without. I am mostly the polar opposite -- I've had to set new rules because I will go OCD (really) crazy and donate things when I'm in a mood and have major regret later -- but I do have trouble when it comes to gifts. It's crazy how emotional we can get about STUFF.